It moves more cars and stalls more cars than any road in Washington. A concrete scar through the heart of Seattle, Interstate 5 is the backbone of the region’s transportation system. With congestion more than twice as bad as it was in 2011, can anything be done to ease the gridlock? Shortly after 8 a.m. on a recent Tuesday, a semitruck stalled on the Ship Canal Bridge, heading south on Interstate 5. About 10 minutes later and four miles north on I-5, a motorcycle and an SUV collided near Northgate. Another 10 minutes or so after that, and seven miles farther north in Mountlake Terrace, a third collision in the southbound freeway lanes caused minor injuries. All three incidents were cleared within minutes. But soon enough, traffic was backed up in Lynnwood, 13 miles north of the Ship Canal. Can’t the state ease I-5 traffic? Fixes exist, but most of them are pricey. From the cab of his customized F-250 pickup, Ken Buretta, whose job is to clear such routine blockages, listened in on his CB radio and pondered the cascading congestion. “Was that a backup from the Ship Canal?” Buretta wondered. “It’s at Northgate, now it’s at 220th (Street). They’re all five to 10 minutes apart, you’ve gotta wonder. Sometimes the first collision is nothing, it’s the guy coming up over the hill behind, then all of a sudden it’s backed way up there for no reason. The highway through the Seattle region was originally designed as a toll road in 1954 to meet traffic volumes of the 1970s. It reached its capacity in the 1990s. 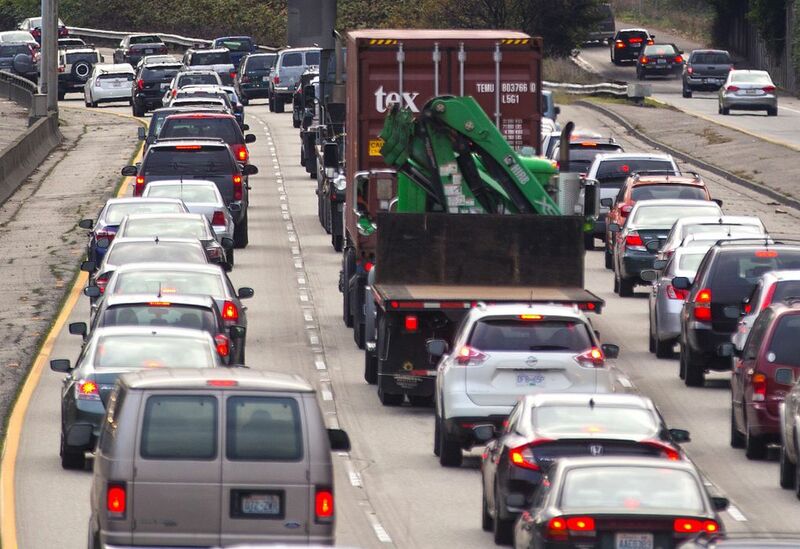 Nearly 100,000 more cars a day travel I-5’s busiest stretch, just south of the Ship Canal, than did 40 years ago, but the freeway is no bigger. Earlier this year, a propane-truck crash on the freeway, just south of its junction with Interstate 90, spread gridlock for miles, crippling nearly every street in downtown Seattle. That was an extreme case. 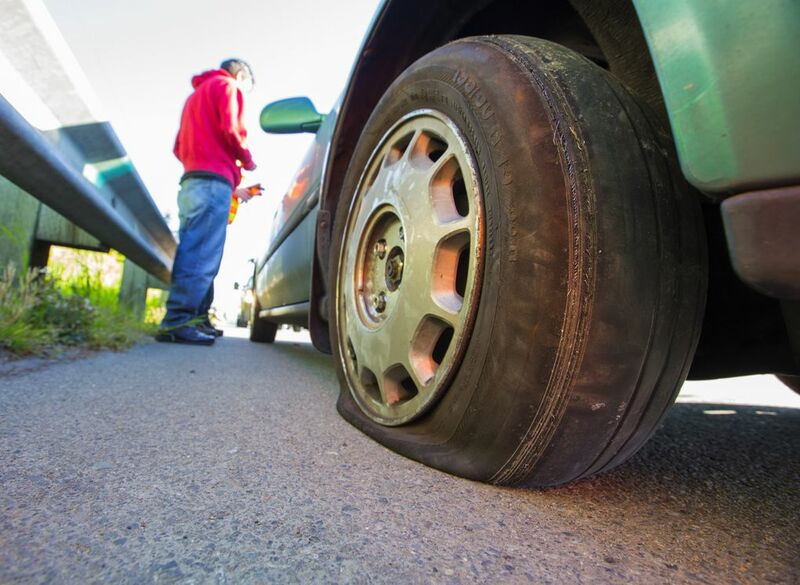 But nearly any sort of blockage can wreak havoc on a roadway engorged with vehicles, mushrooming into delays for thousands of drivers and passengers. 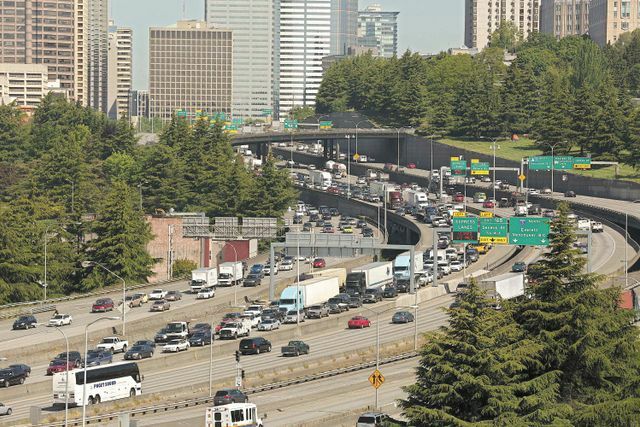 With a wider highway through Seattle likely monetarily and environmentally prohibitive, teams like Buretta’s that race to clear minor crashes before they turn into major backups are among the most cost-effective ways to keep traffic moving. 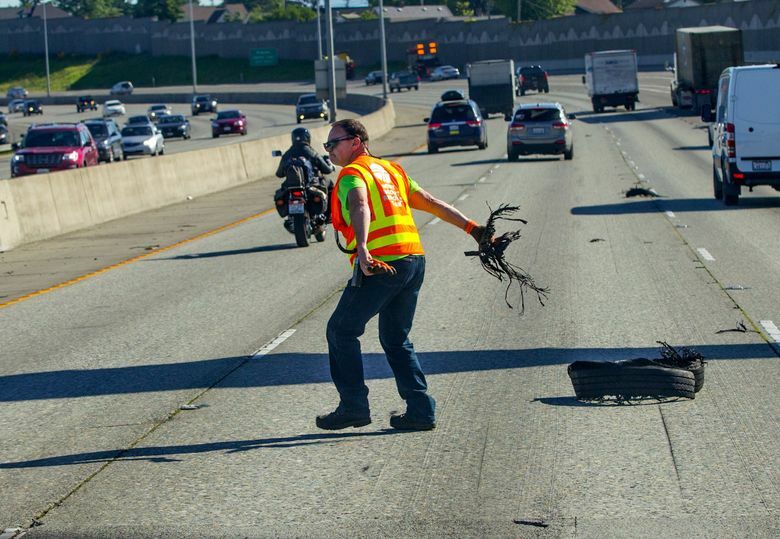 “Anything that’s blocking on the highway constitutes an emergency to us,” said Buretta, who leads a team of seven technicians responsible for clearing blockages on I-5 in Snohomish County. Since its creation, I-5 has moved more people and stalled more people than any other roadway in Washington. It is a scar of concrete and exhaust running through the heart of a vibrant city. It is the lifeline of the region, with the stretch between Federal Way and Everett carrying people more than 2.5 billion miles in 2015. It also accounted for nearly 17,000 hours of vehicle delays in the Central Puget Sound region every day in 2015, more than the region’s other major freeways — interstates 405 and 90, and state highways 520 and 167 — combined. That’s also more than double the congestion from 2011, when delays on I-5 totaled about 7,300 hours a day. As the Seattle region has grown, its central artery has just grown more clogged. Including both directions of highway, there are 91 miles of I-5 between the outskirts of Federal Way and the outskirts of Everett. The vast majority of those miles, 66.5 to be exact, are routinely congested. From 2013 to 2015, average daily travel times for both northbound and southbound commuters into Seattle increased by five to six minutes. The highway was planned as a toll road, but when the Interstate Highway Act passed in 1956 it brought both a flood of federal money to build the freeway and a prohibition on tolling it. The transportation budget proposed by Gov. Jay Inslee and passed by the Legislature this year includes about $2.5 billion in repairs and upgrades to I-5 over the next 15 years or so. That’s about 30 percent of the state’s total transportation budget. In the Seattle region, the freeway is in the midst of a multiyear resurfacing project that’s about 25 years overdue. Sound Transit 3’s light-rail system, as it expands over the next 25 years, will do little to ease I-5 traffic, but it will give some commuters an escape hatch to avoid it. In the Seattle region, with a population roughly twice as big as when I-5 opened 50 years ago at the same size, there’s no one thing that can be done to fix the traffic. But that doesn’t mean there’s nothing that can be done. From added lanes to re-striped lanes to toll lanes, there are a handful of ideas — one likely to happen, some far-fetched, all with an array of side effects — that could ease gridlock on Seattle’s most trafficked thoroughfare. “We are waiting for the Seattle freeway to relieve our congestion,” Seattle City Councilmember Floyd Miller said in 1958. 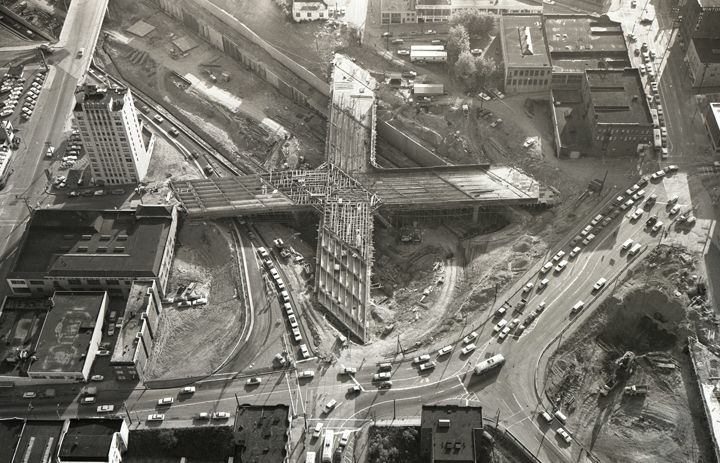 About 4,500 homes were leveled to create the Seattle freeway, as the city’s segment of I-5 was originally known. It abruptly severs downtown Seattle from Capitol Hill, First Hill and other neighborhoods east. A decade later, we had the Seattle freeway, but the congestion relief? Not so much. “The increasing use of the Seattle freeway by motorists bound on only short, local trips is intensifying a phenomenon described as freeway friction,” The Seattle Times wrote in 1968, a year after the freeway opened in the city. In other words, when it comes to I-5 traffic, it was ever thus. Still, it’s gotten far worse, mainly in how long congestion lasts. Decades ago I-5 was bumper-to-bumper for maybe 30 minutes a day — around shift changes at Boeing plants in Renton and Everett. Now, traffic is congested more than eight hours per day between Federal Way and Seattle, and about seven hours per day between Seattle and Everett. “It did its job of making Seattle a city that was easy to get through; it linked us to the rest of the nation in a very compelling way,” said Leonard Garfield, the director of Seattle’s Museum of History & Industry. “It solved one problem and created others that we continue to grapple with in its wake. This morning in Snohomish County was relatively slow for Buretta and his team. The incidents at the Ship Canal Bridge and in Northgate were south of their territory, although they help out if their King County colleagues are swamped. It’s not always slow. Buretta got a concussion last year — and still struggles with headaches and light sensitivity — when his truck, stopped on the side of the highway to help a stalled driver, was sideswiped. A colleague, outside of his truck to help another driver, was hit by a Big Gulp cup full of ice, thrown by a driver speeding by. Buretta said his colleague was knocked out on the spot and was off work for nine months with a lingering concussion. Statewide, WSDOT’s 80 incident-response drivers handled more than 50,000 incidents in 2015, the most recent data available, clearing the scene an average of 12 minutes and 45 seconds after being notified, according to WSDOT. 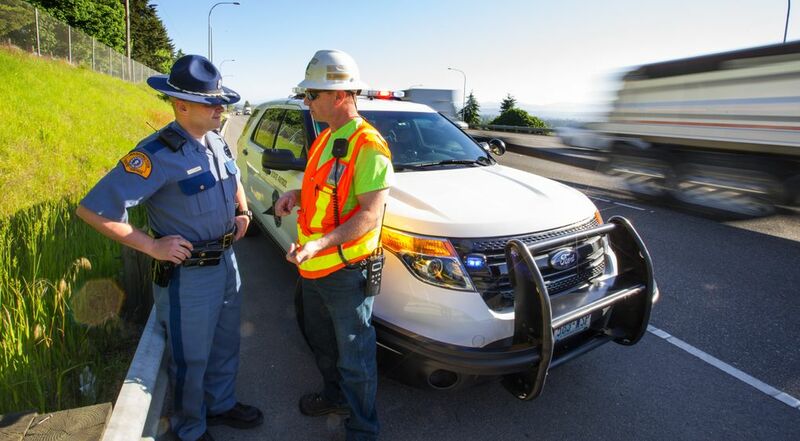 Teams on I-5 in the Central Puget Sound region responded to more than 18,000 incidents. With an annual budget of $4.5 million, the teams are among the most cost-effective traffic reduction strategies that WSDOT has, far cheaper than adding lanes to the interstate. By comparison, a project to add a new lane in each direction to seven miles of I-5 around Joint Base Lewis McChord will cost about $500 million. Equipped with towing equipment, a jack, an air compressor, spare gas and a massive cowcatcher-like steel front bumper, the response teams’ priority, after safety, is clearing the roadway quickly. That front bumper, rather than the tow cable, is usually the quickest way to get a stalled car off the road, or even get damaged road barriers clear of the roadway. “We’ll push, pull or drag to get this clear,” Buretta said. Drivers’ fanciful dreams of an investigative team getting to the bottom of each fender-bender are quickly disabused. 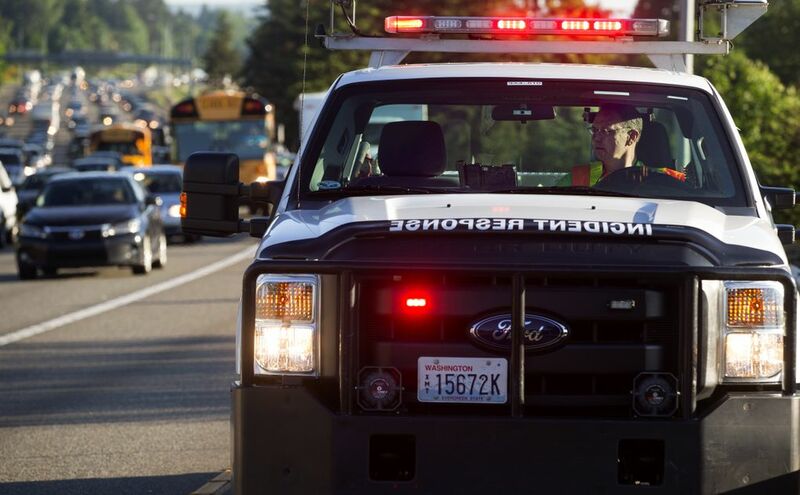 Within the last year, Buretta’s Snohomish County team has grown from five drivers to seven, and their workdays have shifted an hour earlier in the morning and later in the evening, to account for the region’s longer rush hours.